On the night of the 23rd June, the Spanish coastal regions celebrate the festival of <?xml:namespace prefix = st1 ns = "urn:schemas-microsoft-com:office:smarttags" />San Juan. The festival has pagan origins with links to �Midsummer�s night� and involves a huge bonfire built on the beach. The festival in Sabinillas is like all other Spanish fiestas, everyone joins in, there�s plenty of music dancing and drinking and we all party til dawn! About a week before the event a large effigy is built on the beach which takes on a different theme each year. Each year�s theme is a closely guarded secret, no-one knows what it will be until it appears on the beach. Previous year�s statues have been an �Estate Agent in space� (when the property market was booming!!) and famous authors. Sabinillas beach and promenade is packed by 10pm with only shuffling space available. You generally find yourself a spot and don�t move until after it�s all over!! At the stroke of midnight the effigy is set alight � This seems to be the only Spanish Fiesta that actually runs to time!! 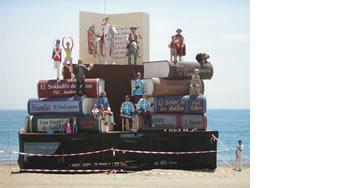 After all the work that goes into the effigy it seems a shame to destroy it but it�s all part of the Spanish culture. Last year, on San Juan night, the wind was really strong, coming off of the sea which meant that when the bonfire was lit, the smoke and flames were lightly to blow towards the crowd. A few people within the English community were saying that they wouldn�t light the bonfire due to the wind but believe me, not much will stop a Spanish fiesta!! Fortunately, the wind changed direction soon after midnight anyway � perhaps the Gods were watching!! A few minutes after the start of the bonfire there is a huge firework display. These are some of the best displays I have ever seen with fireworks going off on the beach and out at sea. After the fireworks it is customary to get your feet (or your whole body!) wet in the sea to cleanse yourself of bad luck. A Spanish friend of mine also told me that you should fill a small bottle with sea water and take it home with you. This is supposed to ward off evil spirits and bring you good fortune. The following year, on San Juan night, you take your bottle of sea water back to the beach, empty it into the sea and refill it again. I�m not sure if any of this is true but I�m all for taking part so this year I�m going armed with a small water bottle! Throughout the night there�s music and dancing which continues into the early hours � the Spanish people really know how to party! This is really one of the best festivals in Sabinillas. If you�re in the area on the night of the 23rd June then Sabinillas beach is the place to be � assuming you can find a space that is!!! If you can�t make it, pop back to this website at the end of June and we�ll see if we can post some pics of this year�s event.